AwesomeJennJenn: #NiagaraChilled - Two Weekends Left To Enjoy Winter Wine Fun! #NiagaraChilled - Two Weekends Left To Enjoy Winter Wine Fun! Last week I posted about visiting iYellow Wine Club and learning about Icewine and the #NiagaraChilled events planned every weekend throughout the month of January. This past weekend I saw a lot of tweets from people down in Niagara enjoying the first weekend of #NiagaraChilled. In case you saw them, and are currently suffering from a case of FOMO - fear not! There are still two weekends left to enjoy the festivities! Below are some details of different events from the #NiagaraChilled website! 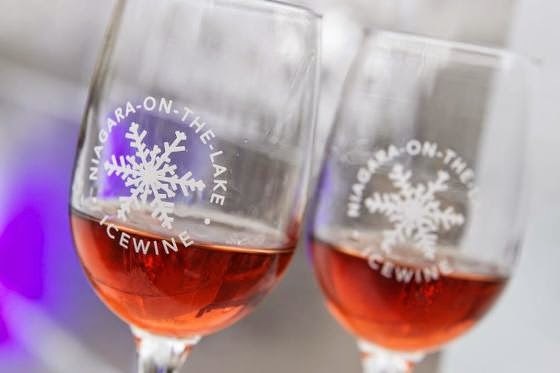 This popular celebration in Niagara-on-the-Lake shines the spotlight on area Icewinemakers, pairing their VQA wines with Icewine inspired tastings from the Signature Kitchen Chefs. Enjoy live Salsa music in the beautiful setting of the Grand Hall in the Courthouse and make it an evening to remember with an official toast served outdoors in the Icewine Village at 10:30 pm. Niagara's "liquid gold" is on full display in every aspect of this evening. Icewine’s decadent, silky texture brought the attention of the international wine world to Niagara, and the recognition and praise continues to pour in. Niagara is spoiled with riches and we’re rejoicing at Windows. Shaken, stirred, muddled or mixed; if you’re a fan of creative cocktails, don’t miss the Flash and Panache Icewine Cocktail Competition. In a nod to the versatility of Icewine, this annual outdoor party in the Niagara-on-the-Lake Icewine Village has Niagara’s top mixologists shaking things up in an attempt to make the most beloved Icewine cocktail. You’ll have the opportunity to sample the Icewine cocktails and creative food pairings served up by local restaurants. Tour the Niagara wine route and enjoy eight award-winning wines paired perfectly with culinary offerings throughout the three weekends of the Niagara Icewine Festival. Discovery Passes are $40, or $30 for a Driver's Discovery Pass. Celebrate the magic of winter and Icewine in Niagara Falls. Enjoy a fabulous weekend of VQA wines, gourmet cuisine and live entertainment both inside and outside! This spectacular event will take place both indoors & outdoors at the Scotiabank Convention Centre, steps away from the magnificent Niagara Falls. Enjoy our outdoor winter wonderland featuring fire pits, Icewine marshmallows, amazing ice sculptures and signature Icewine bars. Step inside the glass doors to sip, sample and savour seasonal vintages and delicious culinary creations. Over 15 of Niagara's best wineries will highlight award-winning Icewines and sparkling wines that will pair perfectly with the savoury dishes created by 12 of Niagara's best restaurants and culinary masters. Enjoy live entertainment during the event including Friday night’s headliner, Jonesy. Saturday features Sandy Vine & the Midnights and the Madhatters. Sunday the headliner is Flatbroke. This hilarious event will leave you laughing with great memories of Niagara-on-the-Lake. Held in local bars and eateries, this Comedy Festival will feature quality performers accompanied with an unmatchable offering of Niagara-on-the-Lake VQA wines, local craft beers and culinary offerings from Signature Kitchens. Icewine is certainly a local treasure and it presents fabulous cheese pairing potential. Join Megalomaniac to explore the joy of rich, carefully crafted Icewine, perfectly paired with Ontario cheese. This is an opportunity to experience the unique potential of sweet wines served with savoury, artisanal cheese. Tickets are $20 (+HST). Seating is limited to 26. Feeling lucky? Win your way to wine country! 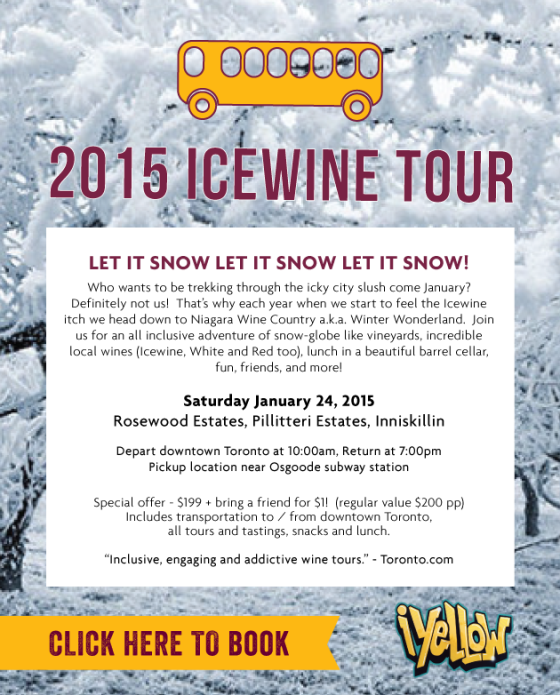 Don't forget - iYellow Wine Club is also hosting a #NiagaraChilled icewine tour themselves, on January 24th. After boarding the iYellow fun-bus, you'll visit Rosewood Estates, Pillitteri Estates and Inniskillin. With all your drinks, snacks, transportation and tastings included - it'll be a fun day! I'll be there too! So come along for some fun!